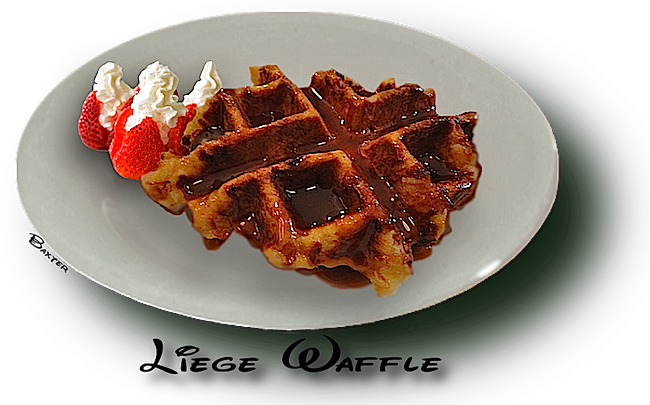 For anyone that has visited Belgium, and especially the town of Liege, the one thing they will always remember, is the "to die for" little dessert waffle that is sold just about everywhere..
Liege waffles are a magnificent treat eaten just plain, but you may want to try them with fondue chocolate, whipped cream, powdered sugar, ice cream, Nutella® or fresh strawberries for an added refreshing touch. contents have a pasty consistency. 2. Let contents sit in mixer bowl for around 60 minutes. Will rise substantially in bowl. powder, salt, butter, and eggs. 5. Let dough rise for 4 hours at room temperature. refrigerator and place dough in your refrigerator overnight. 8. If cinnamon is wanted kneed in at this point. After pearl sugar has been added. 9. Separate the dough into 10 evenly sized balls. 10. Let dough balls sit with pearl sugar for 90 minutes before cooking. until golden brown with a caramelized outside. regular waffle iron, but it can work even with a regular waffle iron. Be careful with hot sugar! It is a pain you will not soon forget!